This summer has truly shown what the phrase “Muny magic” means. 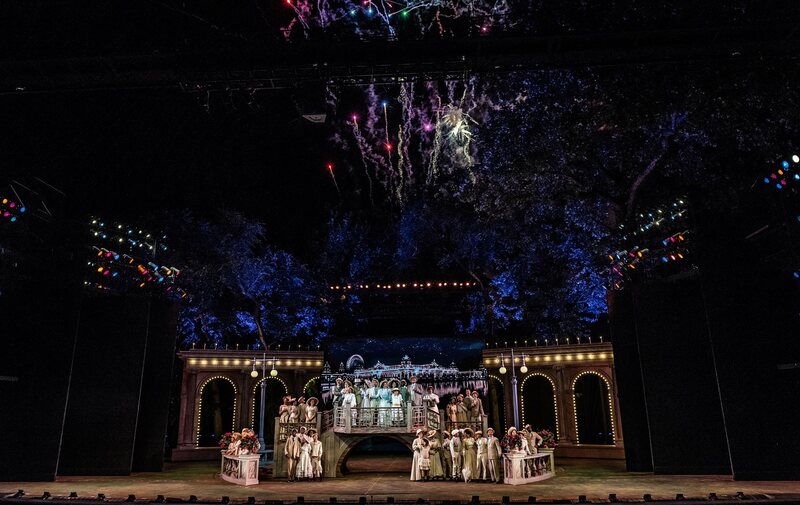 It was clear Saturday night as Meet Me in St. Louis (the final show of the 100th season) opened, that The Muny has spared no expense when it comes to celebrating their centennial birthday. The show takes place largely in the Smith residence, located at 5135 Kensington Avenue in St. Louis, MO. The gorgeous set design by Michael Schweikardt transports the audience to the house at the turn of the 20th century, on the eve of the 1904 World’s Fair. It is home to Mr. and Mrs. Smith (Stephen R. Buntrock and Erin Dilly), their four daughters: Esther (Emily Walton), Rose (Liana Hunt), Tootie (Elena Adams), and Agnes (Elle Wesley), son Lon (Jonathan Burke), Grandpa Prophater (Ken Page), and their housekeeper Katie (Kathy Fitzgerald). Everyone is excited for St. Louis to become the center of the entire world during the fair, but unfortunately for the family – Mr. Smith has received and accepted a job offer to move to New York right after Christmas. Much of the first act is spent hiding the change of plans from his family – with only his wife and Katie knowing. Meanwhile, Rose gets engaged and Esther is just getting to know “The Boy Next Door” – John Truitt (Dan DeLuca). As everything seems to be coming together for the girls, their parents do their best to keep the secret from them until the time is right. Along with the fantastic sets, the costumes in the show are absolutely astonishing! Tristan Raines does a magnificent job dressing the actors in period-appropriate outfits. The beautiful, jaw-dropping dresses are truly a sight to behold. And the guys are always looking dapper in their suits. There is so much to take in during this show, and the costumes play a huge part in that. 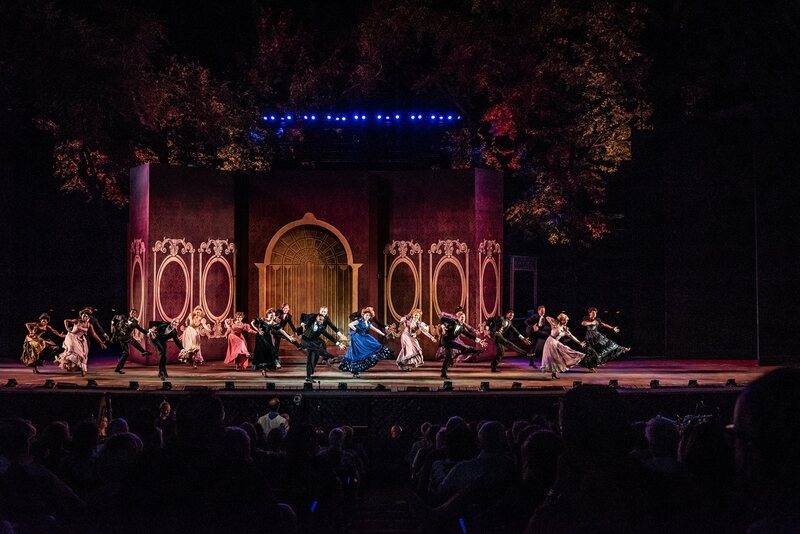 Speaking of dazzling sights, the choreography displayed in The Muny’s first production of Meet Me in St. Louis since 2009 is nothing short of spectacular! Josh Walden has created amazing new steps for the musical – which debuted in 1944 as a film starring Judy Garland. But never has the dancing looked better in what is approaching 75 years since the show’s inception. Numbers like “Skip to My Lou,” “The Trolly Song,” and “The Banjo” are simply mesmerizing! When it comes to singing, the entire cast is exceptionally talented. 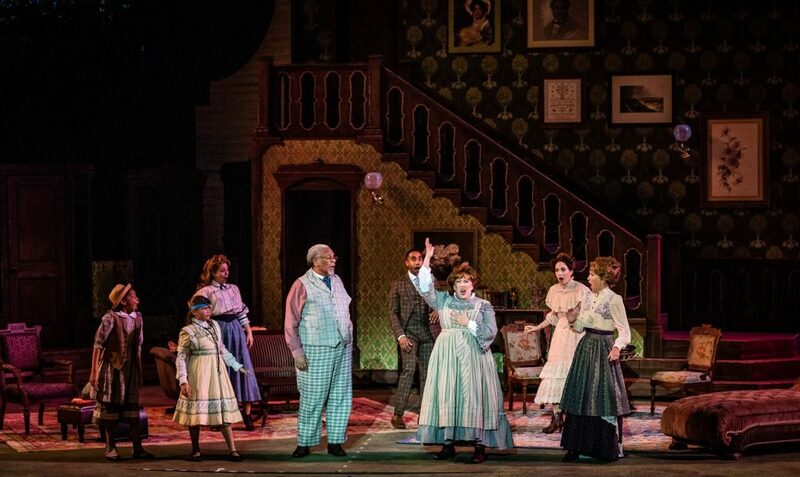 It is always a delight to see the legendary Ken Page on stage, who is delightful as the grandfather of the family who opens the show with “Meet Me in St. Louis,” and brings smiles to the audience through the entire evening. Erin Dilly also has an incredible voice, which is made evident early on, along with Emily Walton as Esther. Once again, I have to mention “The Trolley Song,” where Walton climbs aboard a full-size trolley while singing and dancing as it rotates on-stage. It is terrific! Hats off to Jonathan Burke for leading “The Banjo,” which is an incredible feat of singing and dancing. It was hands down, my favorite part of the entire show. There is so much going on during the entire number, and Burke manages to make it look relatively easy. Video designer Matthew Young must be recognized for his work, creating the moving backgrounds that help solidify the time period. He does an incredible job with bringing the neighborhood and surrounding areas from over a hundred years ago to life. And just wait until you get to the end of the show – you are in for a real treat when the 1904 World’s Fair comes to life! Director Marcia Milgrom Dodge has taken a simple and fun concept, and created a production that is grander than it has ever been before. All of the changes are for the better, and there has never been a more entertaining version. Although I know it may be sacrilege to admit, I’ve never been a huge fan of the film from which this musical is based. However, I have no doubt that this is the greatest production of Meet Me in St. Louis to have graced the stage. It is a show that never hides how proud it is of our city, and what we have accomplished here. 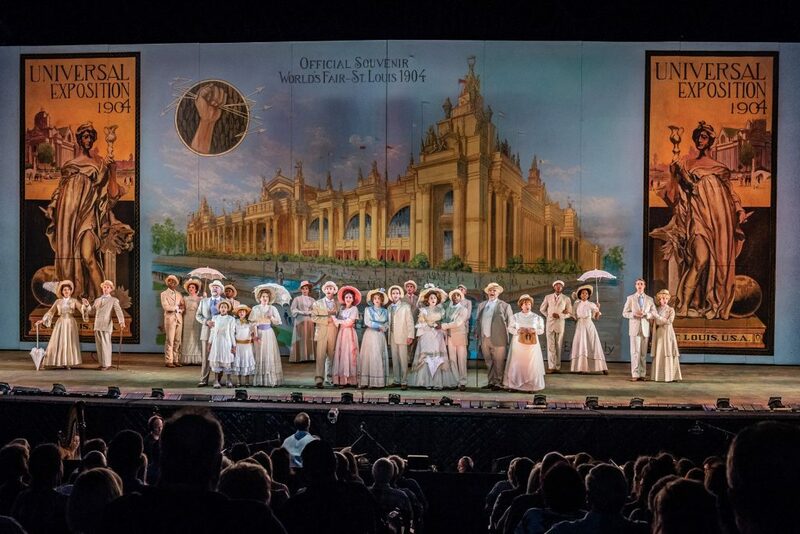 And no exception to that sentiment is The Muny – celebrating 100 years of magic in St. Louis. What a love letter to not only the city, but to everyone in the community. I cannot wait to see what the next 100 years hold for The Muny. I’ll meet you right here in St. Louis next summer. 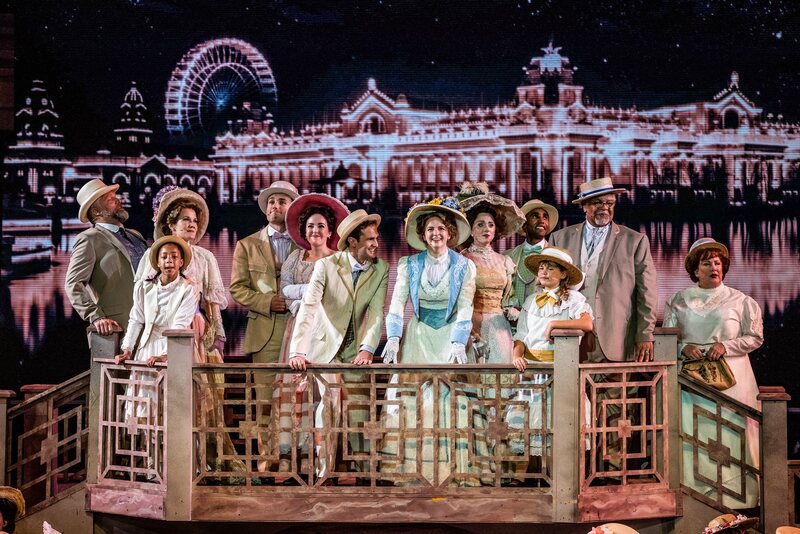 Meet Me in St. Louis plays The Muny August 4-12. Tickets range from $15-$100, and are available through MetroTix. For more information, visit Muny.org.